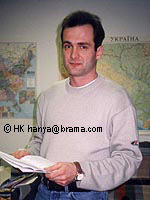 Ukrainian journalist, Heorhiy Gongadze, founder of the news website "Ukrayinska Pravda," disappeared on September 16, 2000. His headless charred remains were found that November. Although some recent progress has been made in the investigation, the crime remains unsolved to this day. Washington, DC vigil tonight in memory of Heorhiy Gongadze - Friday 7 pm next to the Embassy of Ukraine (3350 M Street, NW - Georgetown). Candles, black mourning ribbons. This is not an event to promote any organization or political party.